This month, I had the opportunity to visit our journalism and digital media programs at East Middle School and West Middle School. From our elementary school students broadcasting weekly school news to our award-winning print, broadcast and yearbook programs at our middle and high schools, students have the opportunity to strengthen their skills in writing, design, and production, while gaining valuable experience in teamwork, meeting deadlines and self-confidence. These lessons will serve them well no matter which career they ultimately decide to pursue. We are pleased to be able to offer these types of beyond the core classes and, as an added bonus, our students report that these classes are really fun! Click the image to watch the message. 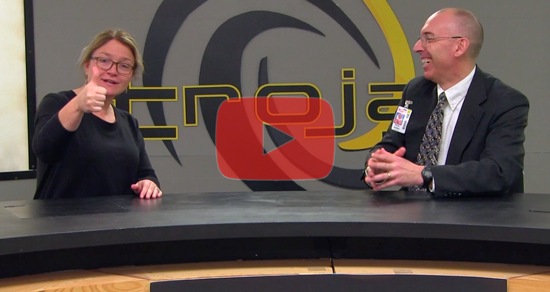 To view previous Our:TCAPS episodes, please click here. 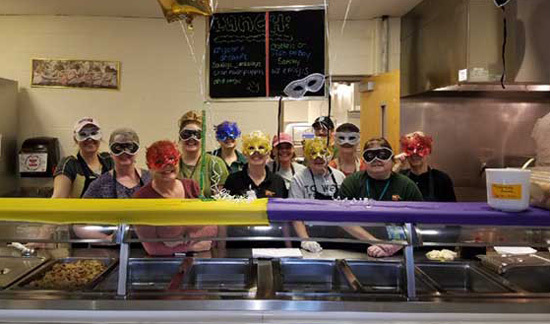 The staff at Traverse City West Senior High School have a donation club, which was founded in February 2017. 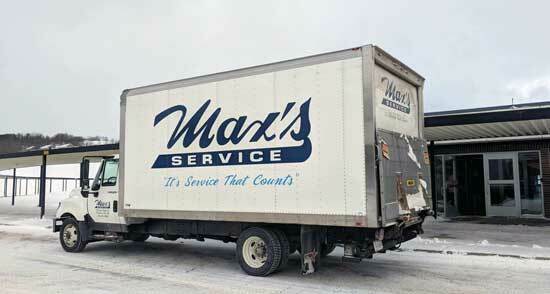 It recently surpassed the $10,000 mark in total donations to non-profit organizations. Each month, club members nominate organizations (week 1), then the group votes (week 2), and the donation is made (week 3-4). Funds have been donated to 21 local, state, national and international non-profit organizations to date. Thirty staff members belong to the group and the average donation is $25 per person. There is no set amount to give, participants are able give whatever they are able. Organizations that have benefitted from the group’s donations include: Michael’s Place, Titan Food Pantry, Brickways, Toys For Tots, Child and Family Services and many more. 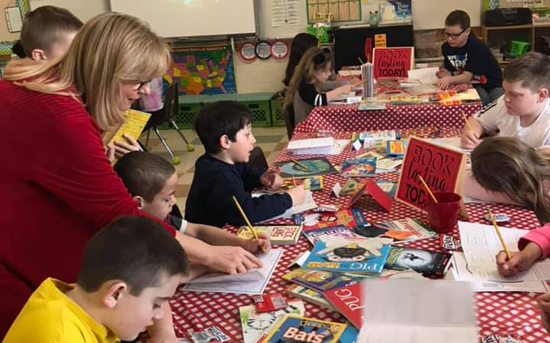 For 12 days, as part of the 'March is Reading Month' activities at Willow Hill Elementary School, students kept track of their at-home reading. Every day they came to school with a signed reading log, they were able to place a reading dot on the reading road of the community mural. 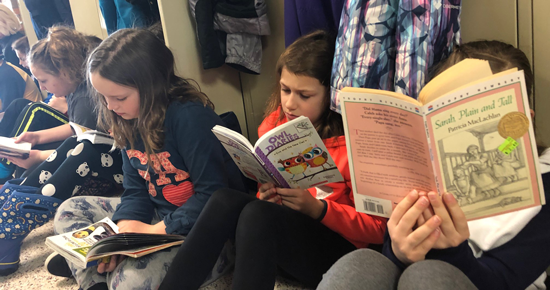 One day this month, 94% of Willow Hill students reported their at-home reading. The students have also enjoyed adding themselves to the community mural. In addition, on the school’s morning news, students also shared ways their classmates have been kind to others during reading month. The school’s Kindness Matters mural is brimming with inspirational good cheer. 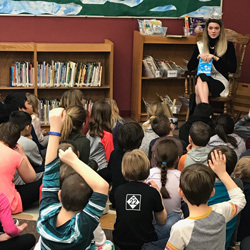 To celebrate all of its students’ successes this month, nationally recognized author and illustrator Philip Stead will visit the school in April. On Wednesday, March 20, 2019, more than 40 Traverse City Central High School student vocalists will embark on a trip to Rome, Florence, and Venice, Italy. They will be performing at St. Peter's Basilica at the Vatican, Church of Ognissanti in Florence, Sala Polivalente in Villafranca Padovana and St. Mark's Basilica in Venice, Italy. Students will also have the chance to experience a musical exchange with Italian students at the School Galileo Chini in Montecatini. Click here to view full performance videos and follow along with the Eurocast Vlog on Central High School Choir's Facebook Page. The Traverse City Area Public Schools Board of Education will host “Office Hours” (formerly known as Coffee Conversations) on March 21, 2019, at 6:00 p.m. at Horizon Books (243 E. Front Street). The new listening session format is intended to offer an opportunity for community members to have one-on-one conversations with board members in an informal setting. The online early registration period for TCAPS’ 2019-2020 tuition-based preschool programs ends March 24th. All interested families are invited to sign up during this time. Families who sign up and complete all required forms during this early registration period (including bringing in an original birth certificate to the school office or administration building to be copied) will be notified the week of April 15th of their approval/placement status. Placements will be made for registrations completed during this time period as the top priority, maximizing the services provided by the program. A registration fee of $40 per student will be assessed at a later date. Please visit www.tcaps.net/preschool for registration instructions and/or additional program information. Please note: All schools with the exception of TCAPS Montessori will be participating in online registration. Families interested in Montessori programs should contact the school directly at (231) 933-6420 to enroll their child. TCAPS elementary schools will host kindergarten roundup in April and May to conduct health screenings and assist families with completing the 2019-2020 kindergarten enrollment process. Please contact your school directly to schedule your child's roundup appointment. Visit www.tcaps.net/kindergarten for more information. 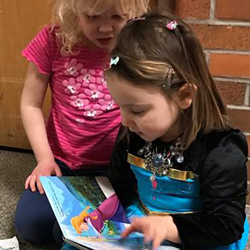 Traverse City Area Public Schools is pleased to announce the opportunity for families to enroll in the Young Fives Kindergarten program at Eastern Elementary School and Silver Lake Elementary School for the 2019-20 school year. The Young Fives program is for young learners turning five years old with late birth dates (between July 1 and December 1). The program is designed to provide younger children additional time to develop their abilities and skills prior to entering kindergarten the following year. Young Fives is a five day, full day program and is provided at no cost. Unless living within the host school boundary area, transportation is provided by the parent. Students will receive math, reading and writing instruction daily and science and social studies instruction regularly. Music, art, and physical education are also a part of the program. Curriculum materials are different than what will be used in kindergarten, but follow Michigan kindergarten standards. Teachers spend additional time teaching lessons and focus on supporting the developmental needs of each child to help prepare him or her for success the following school year. In addition, time for play is also built into the program. A minimum of 18 students are required to be enrolled at the individual site on or before August 1, 2019, in order to be able to run the program at the school. For more information, visit www.tcaps.net/kindergarten. Online registration will open for TCAPS’ Summer Explorers Club on Tuesday, March 26, 2019. Explorers Clubs are designed for children, ages 3-12, and will be available at four locations (Cherry Knoll, Eastern, TCAPS Montessori, and Westwoods). 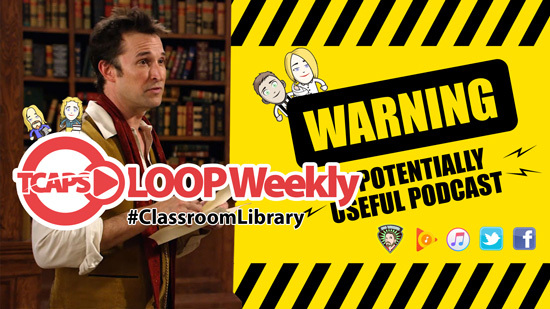 Each week will feature different theme-based activities, field trips and/or special guests. Explorers are invited to sign up for every week or just the weekly adventures of interest. Club fees are $180 per week ($200 preschool). Fees are set for the full week and are not based on the number of days in attendance. Clubs will run June 24 - August 23, 2019, from 7:30 a.m. to 5:30 p.m., and are open to all area students as well as summer visitors. More information: www.tcaps.net/explorers. 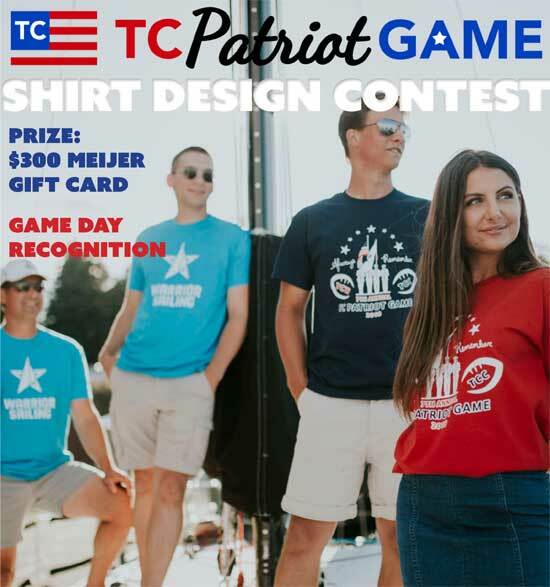 Entries are now being accepted from TCAPS students for the 2019 TC Patriot Game t-shirt design contest. The design for the commemorative shirt plays an important role in the event honoring area Veterans, active duty military and first responders. The winning entry will receive a $300 Meijer gift card and be recognized at the game on September 20, 2019. The winning entry will be selected by the Student Senators from TC West Senior High School and TC Central High School. All entries are due by March 31, 2019. Email your proposed design, school name, and contact information to Karyn Hertel at hertelka@tcaps.net. Should you choose to mail your entry, please send it to Karyn Hertel, TC Patriot Game, 412 Webster St., Traverse City, MI 49686. 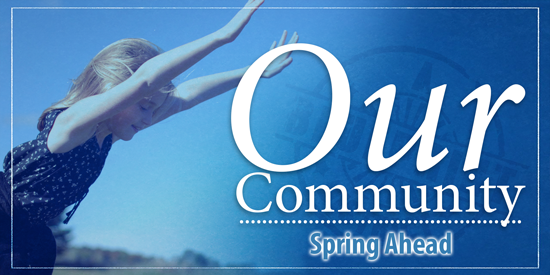 - Thursday, May 16, 2019, 6:00 p.m. - 8:00 p.m.
- Saturday, May 18, 2019, 9:00 a.m. - 11:00 a.m.
- Saturday, May 18, 2019, 11:30 a.m. – 1:30 p.m.
Students must to declare their intent to “test out” on or before April 19, 2019 by completing the online Test Out Application. On April 26, 2019, the Traverse City West Senior High School Academic Boosters (WSH) will host a fundraiser at Boone's Long Lake Inn. The dinner event will fund scholarships for Class of 2019 seniors, which will be presented at the school’s Honors Convocation in May. Tickets are $50 per person or $400 for a VIP table of 8 and cover dinner and entertainment from WSH ensembles. Tickets are limited and can be purchased at the WSH main office or by contacting WSHacademicboosters@yahoo.com. 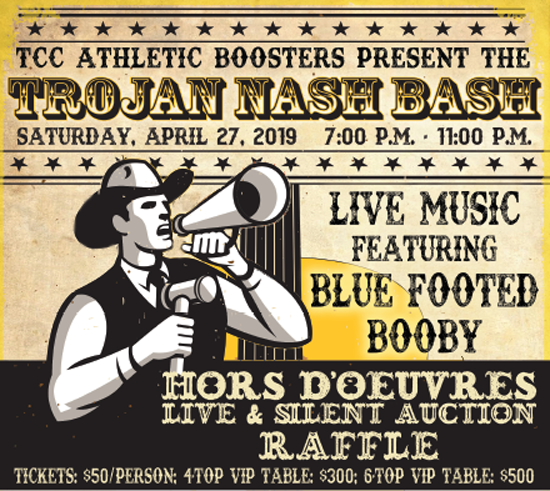 On Saturday, April 27, 2019, the Traverse City Central High School Athletic Boosters will host their annual fundraiser, this year called the Trojan “Nash Bash.” The event will feature the sights and sounds of Nashville and will take place from 7:00 p.m. to 11:00 p.m. at City Opera House (1669 E Front St.). Live music will be provided by the Blue Footed Booby, along with hors d'oeuvres, live and silent auctions, and a raffle. Tickets are $50 per person, $300 for a 4-top VIP table, and $500 for a 6-top VIP table. Visit www.TCTrojanPride.com for more information. The Traverse Bay Area Intermediate School District (TBAISD), in collaboration with the Traverse City Area Chamber of Commerce and TBA Credit Union, is seeking nominations for outstanding educators, administrators and educational support staff for the 2019 Outstanding Educator Awards. Anyone can submit a nomination. Nominees should have a minimum of five years of experience in education, contribute to the academic success of students, and work collaboratively with other educators in the region. Each nomination should include a letter of support from the nominee’s supervisor as well as supporting documents from parents and students. The letters of support will be used by a panel of judges in selecting this year’s honorees. Nominations are due April 16, 2019. The nomination form can be found here. Traverse City Area Public Schools announces the opportunity for Veterans to receive a diploma. Under Public Act 181 of 2001 and Public Act 55 of 2014, the board of a Michigan school district can award high school diplomas to WWII, Korean Conflict and Vietnam Era Veterans in recognition of their service and sacrifice. The law permits WWII Veterans who left high school between December 16, 1940, and December 31, 1946, and did not subsequently receive a high school degree, to now apply for a diploma. Korean War Veterans who left high school between June 23, 1950, and January 31, 1955, may also apply. Veterans of the Vietnam Era must have served between February 29, 1961, and May 7, 1975, to qualify for this diploma. Family members may apply on the behalf of a living or deceased Veteran. For more information, please contact Mary Beth Stein at 231-933-1718. Students from Traverse City West Senior High School participated in Math Field Day on March 8, 2019, at U of M Flint. A total of 24 teams competed and they were broken up into three divisions (small, medium, large schools). WSH was placed in the medium schools division and took 3rd place out of eight teams in the division. Ian Beck took 1st place in his individual Chalk Talk event on Fibonacci Numbers, and Leo Shelp took 1st place in his individual Mad Hatter event. The other students participating were Omar Nadji, Nick Gustafson, Annalysse Gronda, and Ruthy Lynch. The TC West Math Club is led by teachers Maria Chargo and Carl Edgren. Four vocal students from Traverse City Central High School, Annabelle Arends, Morgan Davis, Lauren Fleming, and Emlin Munch, were named finalists in the 25th Annual Italian Songs and Arias Vocal Competition. To enter the competition, student vocalists submitted recordings of two Italian classical songs or opera areas. The final competition will take the form of a live concert, where the finalists will perform their selections with piano accompaniment Sunday, May 5, 2019. The finalists, ten in total, receive a professional coaching session from Michigan Opera Theatre’s Vocal Coach Tessa Hartle at Detroit Opera House as well as a cash prize ranging from $100 to $1,000. The event is sponsored by the Verdi Opera Theatre of Michigan, the Italian American Club of Livonia Charitable Foundation, the Italian American Cultural Society, and Michigan Opera Theatre. Both staff and students enjoyed the opportunity for a change from the usual routine and had a great time and a delicious meal. TCAPS is pleased to offer breakfast options to all students. Eating a healthy meal before the start of the school day helps fuel students' minds for learning. Every school has breakfast available in the cafeteria except Traverse Heights Elementary School and Blair Elementary School which have breakfast in the classroom. Breakfast is provided free of charge to all students attending Blair and Traverse Heights. Do you have a student currently staying with you? Does your child bring other students over to stay at your house and they stay longer than a sleepover? Do you know a youth in crisis because they are "couch surfing"- sometimes on your couch? There is support available to help our youth navigate troubles at home, an emotional crisis, housing instability, and other issues that may cause them to not be at home. The confidential services of TCAPS’ Students in Transition Empowerment Program (STEP) can support you in getting connected with district and community resources that can help. Learn more: www.tcaps.net/step. At the March 11, 2019, Board of Education meeting, board members signed a proclamation naming April 2019 Social Host Responsibility Month. The month calls upon parents, citizens, homeowners and property owners to host gatherings responsibly and to take measures to eliminate access to alcohol to persons under the age of 21. Read the full proclamation. Vaping (the common name for e-cigarettes or vapor devices) among youth continues to be a serious local and national issue. E-cigarettes or vape pens are small battery-powered devices that disperse nicotine and other associated chemicals that users can inhale. Originally developed as a “safe” alternative to traditional tobacco use, e-cigarettes and vape pens have steadily gained popularity among teens. View pictures of many of the common vaping devices that are prevalent in Northern Michigan. Parents are asked to review their child’s student handbook to learn about the school implications of using these devices and speak with their child about the potential risks to their health. TCAPS is pleased to announce the selection of Eastern Elementary School as a recipient of the Builders Exchange of Northwest Michigan’s 2018 Award of Excellence in Construction. The Eastern Elementary School reconstruction project was nominated for the award by Mike Trippe of The Bouma Corporation, which was one of the local companies to work on the project. The 2018 recipients were selected by a panel of community judges. An award presentation to honor recipients was held at the Traverse City Country Club on February 7, 2019. The Builders Exchange of Northwest Michigan is the leading plan room for commercial construction projects in northern Michigan. It is a member based, non-profit organization consisting of general contractors, sub-contractors, architects, engineers, material and equipment dealers and suppliers to the building industry, which supports a 17 county territory. "The purpose of the food waste audit is to demonstrate how much food students throw away with the goal of decreasing this waste through the year." Blair Elementary School conducted its first cafeteria food waste audit as part of their participation in Fuel Up to Play 60. The student leadership team, with assistance provided by MSU Extension, helped their classmates sort through lunch waste and separate out milk, food, and plastic waste. These containers were then weighed and logged by the student team. Students were surprised to see how much food ended up in the buckets and were even more astounded to learn that the 5th graders threw out the most food and milk. The purpose of the food waste audit is to visually demonstrate how much food students are throwing away with the goal of decreasing this waste as the year progresses. 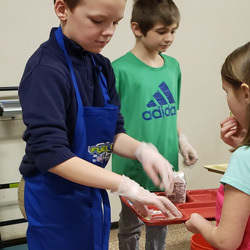 Initiatives such as nutrition education by the TCAPS PE-Nut program, competitions and encouragement provided by the Fuel Up to Play 60 student team, and working closely with food service will also help to shrink lunchroom waste. Next on the agenda is for the student team to huddle up and plan other activities to help their peers enjoy their food and waste less! 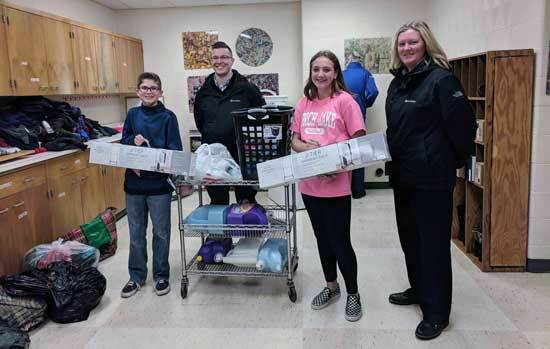 As part of their school efforts to embrace the Intense Student Support Network, the TC West Middle School Unity Council created the Giving Closet. 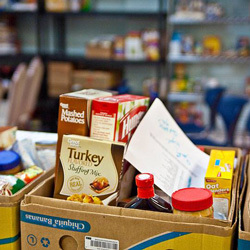 It is a place where students in need can access food, school supplies, new clothing and more. Now, due to the kindness of Max’s Service, students will be able to wash their clothing at school with the donation of a brand new washer and dryer. Many thanks to Cortland and George from Max's for the delivery and installation and to our friends Lisa and Matt from Price Point Used Car Super Center who gave detergent, laundry baskets, dryer sheets and much more to complement the donation.To donate to the TC West Giving Closet, please contact Kathryn Baumann at baumannka@tcaps.net or 231.933.8386.